My husband and I moved to our off-the-grid homestead in 1999. It is an old farm house that was built in 1850 and had been a deer camp since 1924. It never had any electric lines running to it since the nearest power poles are a half a mile away. That was fine with us. At that time we were anxious to start living our homesteading life, off-the-grid. Our house also did not have a bathroom when we moved in. It had an outhouse and a downstairs bedroom. We made the downstairs bedroom into a bathroom. My husband bought a used claw foot cast iron bath tub and hooked up the drains so they drained outside into a leach field. Then he put a kitchen sink in the kitchen. It also drains into the same leach field which goes under some raised beds. 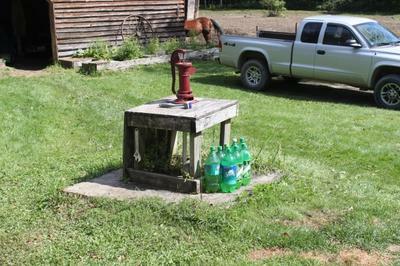 The water for our house comes from a hand dug shallow well right out front. We carry it into the house daily. The water from this well is the best I have ever had! All winter we keep two pots of water heating on the big wood stove in the living room for instant hot water. Since the drains all drain out, all we have to do is carry water in and pour it into the tub for a bath. Adding hot, depending on what temperature I want. For showers, in the summer we keep some green soda bottles outside in the sun. For your shower you can stand in the tub and pour the water on yourself. This method works better than the camping or solar showers. You may also pour water into a bucket setting in the tub and dip it on yourself for the shower. We are pretty conservative with water use around here due to us having to carry it. I feel it is pretty routine now that I have used it for so long. My husband is planning on bringing the water into the house soon. It has been a matter of money, why we haven't been able to yet. Once we have our wind turbine installed and hoping to add two more solar panels to our array, I hope we can add water pumping, the washing machine and refrigeration to our household conveniences. What a wealth of information you must have and I want to hear all of it! The idea of water bottles is phenomenal! I've never thought of that before! I also love solar panels and wish I had a roof covered with them. I will be so excited to see pictures when you get the solar panels and wind turbine working. Living without running water since 1999. Very interesting. She should write more columns. Very interesting way to live. Definitely not for sissies! Would love to hear more about easy ways to conserve and reuse water, especially during these drought situations. I've always been a city-girl, so the idea of living off the grid is amazing to me. Yet, you make it sound and seem just what it is - natural and, if I might add, much more environmentally sound than most of us. Great idea about using the soda bottles as a solar shower. I'm going to remember that one when we go camping!